This slow cooker chicken enchilada soup recipe is easy, cheesy, and healthy too! One of my best crock pot recipes for an easy Mexican meal, that takes only 10 minutes to prep! One of the unpleasant secrets of adulthood is that, when you are sick, the person who most often stays home to feed you Slow Cooker Chicken Enchilada Soup, refill your water glass, and make sure you take your medicine on time is….you. Currently, I’m battling a wicked cold, which if you follow me on Snapchat (username wellplated), you’ve likely heard via my super stuffed-up, frog-like voice. Whenever I’m sick, the only foods that sound appealing to me are carbs in some form, usually breakfast cereal, and vanilla ice cream. I know, however, that those two along cannot give my body what it needs to fight away the illness. Beyond chopping the onions and garlic, this is a “dump and go” crockpot recipe —no precooking of any ingredients required. It takes a few minutes to measure the spices, but they are absolutely worth it. Toss everything into your slow cooker, walk away, and you’ll have a nourishing dinner waiting for you when you return. I was torn as to whether to name this recipe “Slow Cooker Chicken Taco Soup” or “Slow Cooker Chicken Enchilada Soup,” but I opted for the latter, because the spices and adobo chilis remind me of the smoky flavors of red enchilada sauce. No matter what you call it, Slow Cooker Chicken Enchilada Soup is an easy, warming meal that’s ideal for anytime you are feeling under the weather, or for when the weather itself is too chilly for your liking. Further, both names give us full license to smother the soup in all manners of tasty toppings, which I insist you do, as it really makes the dish. My favorites are sliced avocado, cheese, and plain Greek yogurt (my swap for sour cream), though crushed homemade baked tortilla chips or even diced jalapenos wouldn’t be remiss. Finally, if you are looking for a more classic chicken noodle soup, check out the recipe I posted at almost this exact same time last year, Healthy Creamy Chicken Noodle Soup. Why? Because, ironically, I was sick then too. If you want a vegetarian get-well-soon soup, try Brianne’s Flu Buster Vegetable Soup recipe. I think my body dislikes the first week of January, and I should head to the tropics at this time next year. 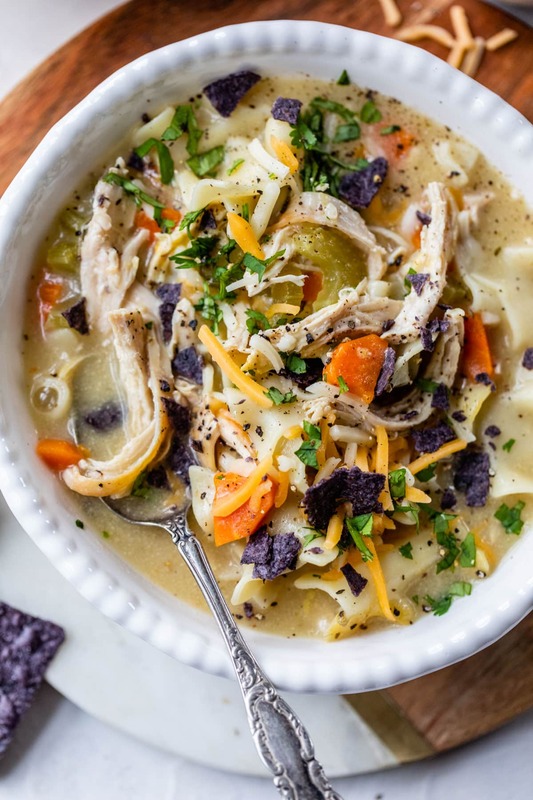 The Slow Cooker Chicken Enchilada Soup can join. Nasty cold, please stay at home. Slow cooker: I’ve owned this one for years and love that once the timer is up, it automatically switches to “keep warm,” so my food stays hot without over cooking and is ready for me when I get home. This slow cooker chicken enchilada soup recipe is easy, cheesy, and healthy too! Place the chicken thighs in the bottom of a 5 quart or larger slow cooker. Sprinkle with salt and pepper. To the slow cooker, add the garlic, onion, diced chipotle peppers, adobo sauce, diced tomatoes, cumin, coriander, green chilis, drained black beans, and drained Mexicorn. Pour 3 cups of the chicken stock over the top. Cover and slow cook on high for 2 hours or low for 6 hours, until the chicken is cooked through. With a fork, remove the chicken thighs from the soup, then shred. Return the chicken to the soup, and add additional chicken stock to the slow cooker if it seems too thick. Recover the slow cooker and cook on high to rewarm for a few minutes as needed. Serve hot with desired toppings. This looks great! I have discovered through the TimeHop app that I too seem to get sick a lot this time of year. I’m battling the last of an awful cold that I had going through the New Year. Bleck! I think I should retreat to the tropics as well. Kori, I’m sorry to hear that you have a cold! I hope you feel better ASAP. The tropics do sound nice, don’t they? So true …..much easier being sick when mom or dad are around to take care of things. This soup is right up my alley!! It reminds me of chicken tortilla soup, but slightly different. 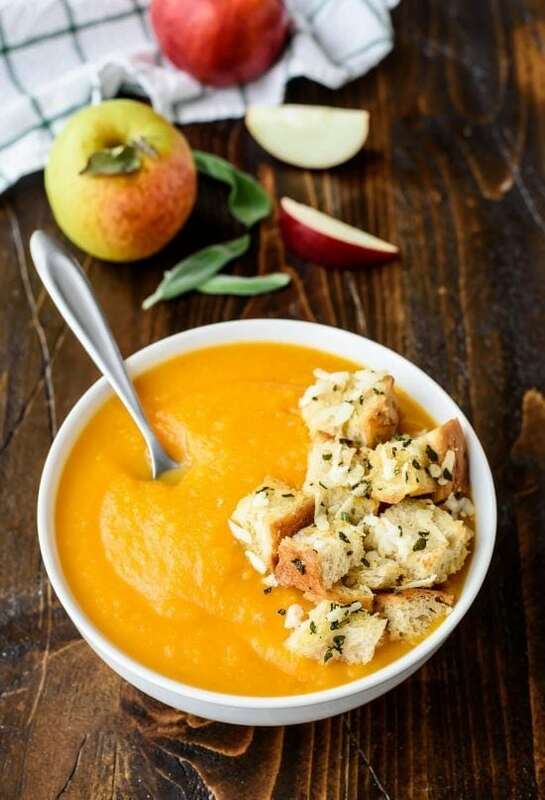 Love crock pot recipes…..thanks for sharing this perfect winter time soup! Hope you feel better soon! Hi Ruthie! The soup recipe is in the recipe box that a little above the post comments. Is it not showing up on your computer? This soup is so yummy!! I just had a bowl and knew I had to come let you know how great it is. Thank you for sharing this. Thank YOU for trying the recipe Michelle. I’m so happy to hear you liked it, and I really appreciate you leaving your review too! When making this amazing soup I thought, “A Midwesterner probably doesn’t know spicy” so I added a couple more adobo peppers and chucked more sauce in too. Wooooooo baby! My hubby & I sat slurping our soup & wiping our noses at the same time! Obviously the amounts given were plenty. Amazing flavor. I’ll stick to the recipe next time!! Heidi, I do like my spice, but I bet it was great with a little extra kick. I’m glad you liked the flavor, even if it was hot :) Thanks so much for trying the recipe and letting me know how it turned out for you! Great question, Charlotte! Regarding nutritional info, this particular recipe was published just before I started adding the info to all of my new recipes in January 2016 (you’d usually see it in the recipe box at the bottom). Unfortunately, it’s pretty time consuming, so I’m unable to go back and add it to past recipes. If you’d like the nutritional info for any of my older recipes (or really any other recipe or food), you can actually calculate it yourself for free at myfitnesspal.com (this is how I calculate the new recipes on my blog). I’m sorry I can’t give you the information for this specific one, but I hope that My Fitness Pal will be a helpful resource for you. Hi Kerri, I’d suggest using lots of cool, creamy toppings—avocado, sour cream (or greek yogurt), and cheese will definitely help to tone it down. If you do try the soup again, you can omit the peppers entirely or try using just one or half of one to get to a heat level that you enjoy!